Instantly prepare electronic binders from anywhere. What is an Electronic Closing Binder? Previously closing binders were manually produced through scanning, printing and compiling paper documents into a three-ring binder. The complete binder was then physically mailed to clients and third parties. Today binders are produced and delivered electronically and thus are more commonly known as electronic closing binders. An electronic closing binder clearly summarizes and organizes your transaction. 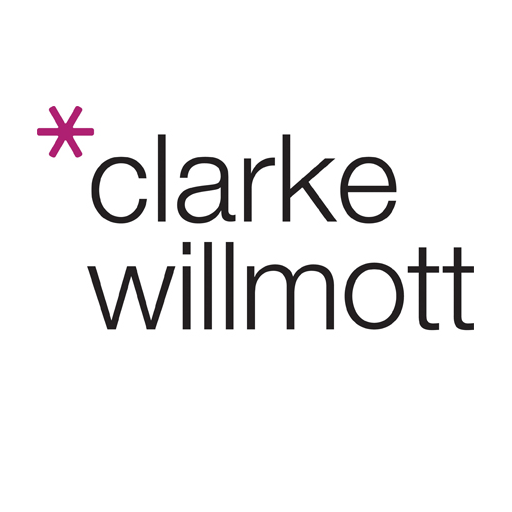 It includes a closing statement and copies of all relevant documents generated throughout the transaction. The electronic closing binder is fully text searchable, indexed, bookmarked and once complete is electronically distributed to all parties involved. 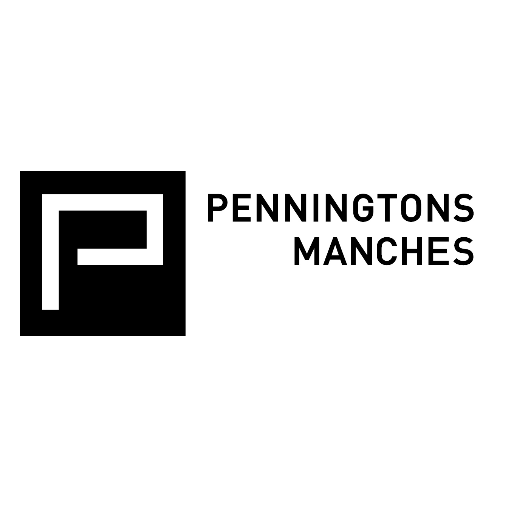 Electronic closing binders are commonly used in legal transactions, commercial/ residential real estate closings, and in mergers and acquisitions (M&A) transactions. However, depending on the work you do, electronic closing binders can often have different names. For example, they can be known as closing books, record books, closing transactions, transaction deal bibles, closing bibles - to name just a few! Now we’ve discussed what an electronic closing binder is, let’s discuss some of the key reasons you should choose to create your closing binders electronically rather than manually. Enhance Customer Satisfaction. Electronic closing binders take significantly less time to produce and can be delivered to your clients instantly. This will add value to your practice and your clients will love you for it! Save Hours of Work. There’s no denying it, manually producing closing binders is an incredibly labour intensive and time consuming task. Producing binders electronically will help you save hours of time. Reduce Costly Printing and Distribution Costs. With electronic closing binders there is no need to print off copies unnecessarily and you can even securely send or share the binder once completed. 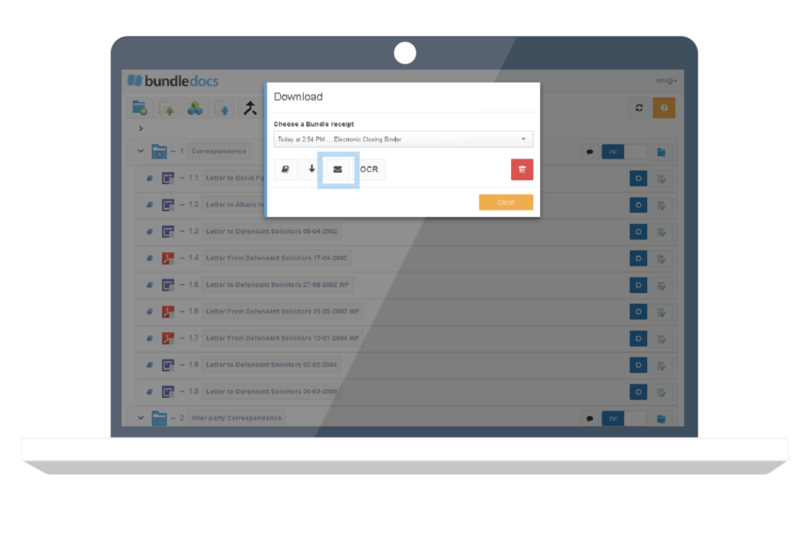 Did you know Bundledocs have an in-built Secure Share feature which allows you to send binders that are too big to send via email - with no extra cost! Environmentally Friendly. Not only will electronic closing binders save you time, money and hassle, it’s also a much greener solution when compared with other methods. Win, Win! Creating your closing binder is incredibly simple. Quickly and easily create folders, sub-folders and volumes with the click of a button. With complete control you can create as many folders as you need. Need to rename anything? Simple, just double click! It gets better. If you want to help save even more time then use Bundledocs Templates. Templates are a real time saver and come in really handy for those that create closing binders regularly. Simply save your binder structure and format settings once and never repeat the same steps again. Great, we’ve created and structured our electronic closing binder. Next, we need to add some documents. Bundledocs makes it simple to access your transactional documents from anywhere, regardless of where they’re stored. Effortlessly add documents from your desktop, computer or if they’re saved in a case or document management system, you can access them here too. We integrate with leading systems including iManage, Tikit Partner for Windows, NetDocuments, Dropbox and Actionstep - to name a few. 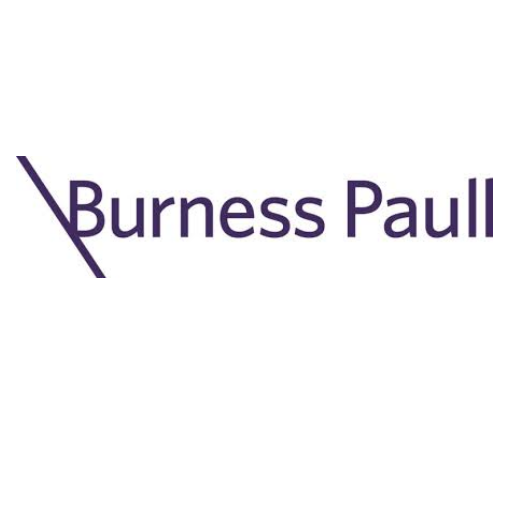 Discover more about our integration partners. Any document uploaded can be renamed by simple double clicking. Plus if you’re unhappy with the ordering of documents you can drag and drop documents in place. As you can make unlimited changes - even after the binder is generated - you don’t have to worry about getting it right the first time around. Did you know? 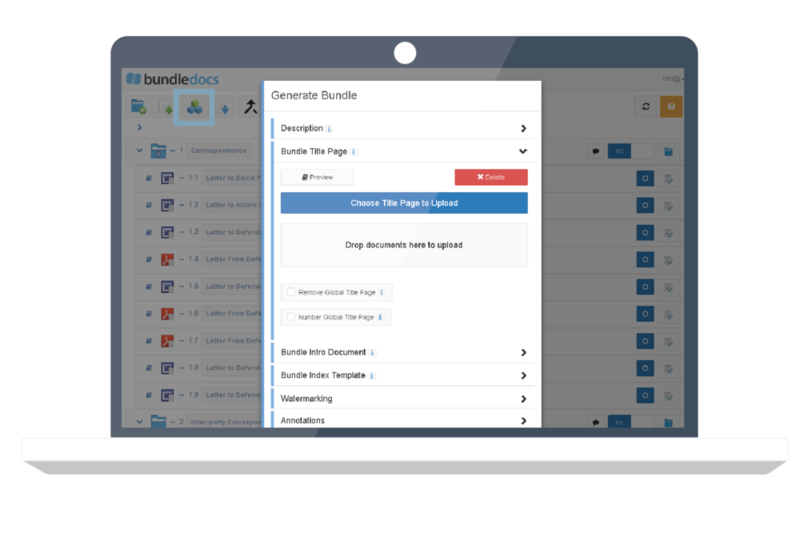 Bundledocs supports any document type and automatically converts all files to PDF when uploaded. So whether they’re emails, PDF’s, word documents, scans or images - everything is instantly created in PDF format without you have to lift a finger. As if that wasn’t good enough, we keep your original file too. This is great if you want to share the original file format with others later. Amazing! Cover Page: This one is simple, just upload a copy of your cover page. You control the look and feel of your cover page. For example, include key information such as the name of the transaction, the parties involved, the closing date - even add your firms branding and clients logos to customize further. The possibilities are endless. Index Page: Bundledocs will automatically create the index page or table of contents page for your closing binder. With a single click Bundledocs will list all your transaction documents, add page numbers, create bookmarks and hyperlink all items on your index page so you can easily move around your electronic closing binder. Click and you’re there! Wait, there’s more. One of the best things about Bundledocs is its ability to handle changes. If you need to amend your binder, add/remove documents at the last minute or even restructure the entire thing, there’s no problem. Simply re-generate and Bundledocs will instantly update your binder, bookmarks, hyperlinks, cross referencing links, page numbers - everything! Page Numbering: If you need to apply page numbering to your binder, we’ve got you covered. Paginating your closing binder is automatic and can be done in an instant. You have the power to choose what numbering format is applied to your bundle or if you want any page numbering applied at all. It’s fully customisable so the choice is yours. Electronic Closing Binder Format: Bundledocs offers the ability to export your completed binder as a single PDF file or to generate as a zip file. 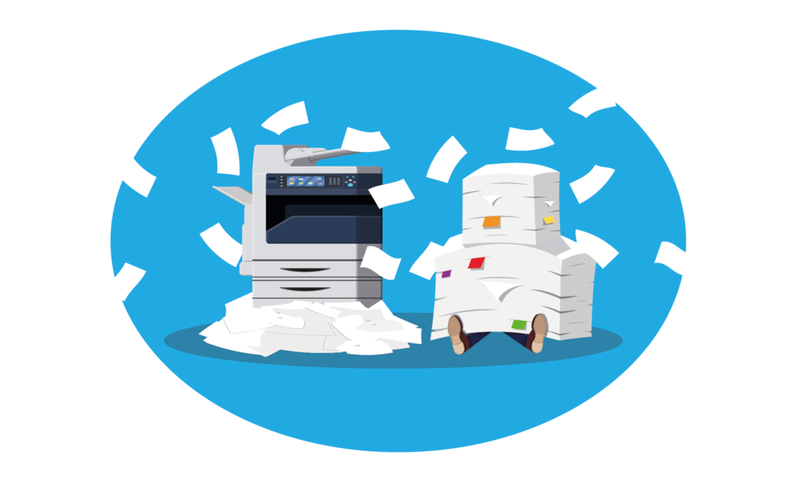 If you generate a PDF (the default setting), this will produce a single PDF document containing all your sections and transaction documents in one file. Alternatively, if you choose to generate a zip, this will create a zip file with your cover page, index, and all documents in a folder structure. The documents can be included either in their original format or in PDF. Hurray, we've made it to the final step. When you are ready to complete your electronic casebook, simply click the Generate button. Your cover page, index page and transaction documents will be merged into a single PDF closing binder. Instantly available and ready to download or share electronically. Send For Free. The days of manually sending closing binders are a thing of the past. 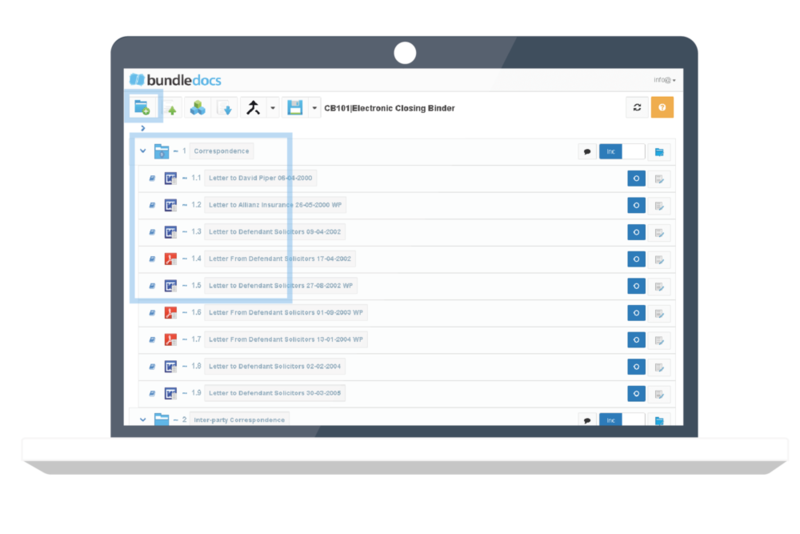 Bundledocs offers an in-built Secure Share feature to allow you share your completed closing binder electronically with anyone, regardless of where they are based. One of the best things about this awesome features is you don’t have to worry about the size of your binder. So there are no printing fees - no distribution costs - no file limits - no hassle and no reason not to use it! With one click your closing binder is automatically indexed, numbered, hyperlinked & bookmarked. Incredibly easy to use and available in an instant. Binders are now available in minutes - not hours! Customize to suit your firms branding or house style. With custom cover pages, index pages and options to change font, style, page numbering and bundle format, you can ensure you create the perfect binder every time. No need worry about duplicates and delivery costs. Create your bundle and grant access to anyone that needs it. Alternatively, use our Secure Share feature to safely send password protected binders to others. No upfront costs, no training needed, no minimum contract terms - Just pick it up and get going! Make use of our FREE Trial and FREE online demonstrations. There is no credit card required and no obligation. 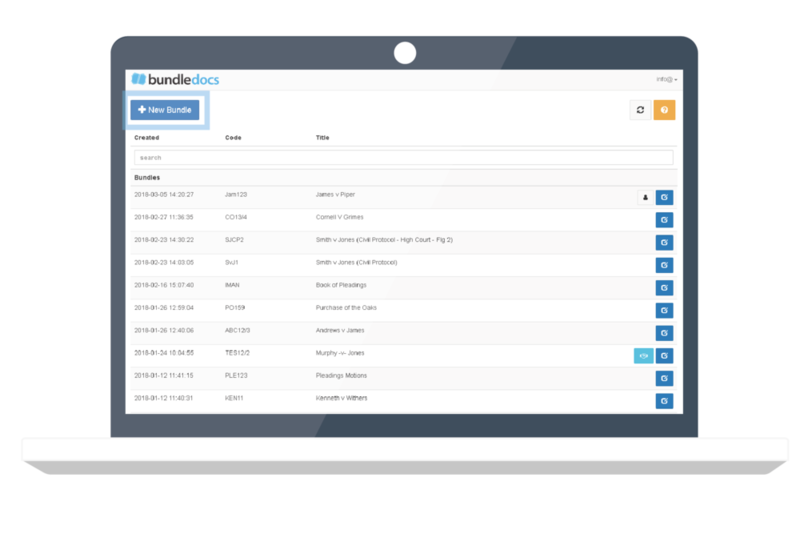 Bundledocs Support is included at no extra cost. Want to go it alone? Our manual is available to download 24/7.